Congressman Aaron Schock, who has no primary opponent in the upcoming elections in March is looking to move beyond his recent news cycle (no...not that one. This one.) by stepping up and doing some of the heavy lifting for the National Republican Congressional Committee. Lynn Sweet - who we adore for her tough, smart insider coverage - has the story of Schock taking on the Chairmanship of the annual NRCC Fundraising dinner in DC. Rep. Aaron Schock R-Ill. is the chairman of the National Republican Congressional Committee March fundraising dinner here, one of the major events to raise campaign cash for the House GOP political operation. 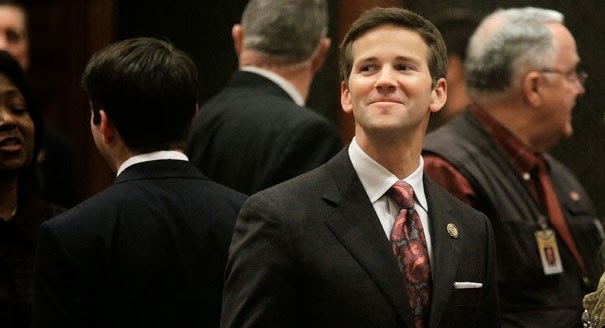 Schock faces no opponent in the March Illinois primary, leaving him free to work on the March 26 dinner. Schock already raised $1.1 million for the dinner, the NRCC said on Tuesday, and pledged to raise another $1 million by March 26. “Aaron Schock is a bright young leader, one of the hardest working Members in the House and committed to growing our majority,” said NRCC Chairman Greg Walden said in a statement. Let's be honest about this stuff, folks. Fundraising is the lifeblood of a political animal. If you can raise money, you can win. If you can't, then you'll have a lot tougher time. We were hopeful that Aaron Schock would have joined the Illinois Governor's race, but when he passed, we figured he had another plan in mind. It can't be so bad, being a big shot for the NRCC, but will that be enough for Schock?